What is the S fund? 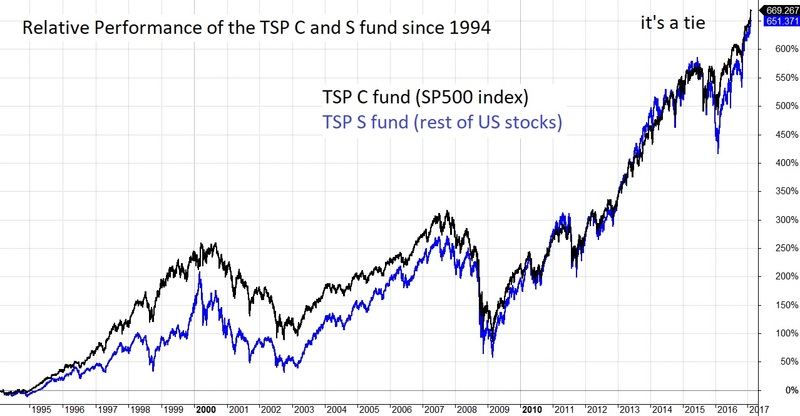 The TSP S fund tracks the performance of all the US stocks not in the SP500 index via an index called the Dow Jones Total US Stock Market Completion Index. 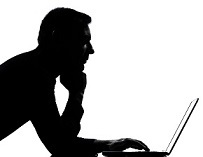 For simplicity, we refer to it as the non-sp500 index. This index includes over small and mid-sized 3000 companies. While the index tracks 6 times as many companies, the market value of these smaller companies combined is only a quarter of the largest 500 companies comprising the SP500 index. To hold the total US stock market in a diversified allocation, you would need to allocate 4 parts to the TSP C fund and 1 part to the TSP S fund such as [80% C and 20% S] or [40% C and 10% S]. The future returns of the both the non-sp500 index and the SP500 index depend on its current valuation level. The SP500 swings in value relative to many measures during market cycles (bull and bear markets). Higher valuations (not the same as price) mean lower future returns. Many investors choose funds based on past returns. Past returns are at their highest near market tops and lowest at market bottoms. To compare the make-up of the major equity funds by sector weighting please review compare equity funds.